In Greek mythology a Minotaur was a hybrid creature with the body of a man and the head of a bull. Such a creature provided the inspiration for a pairs trade involving short VXX at-the-money calls and long VIX at-the-money calls. It is possible to back test this strategy, but sometimes I like to put the trade on, see how it develops and get a sense of some of the potential hurdles. I fully understand that the results will not be statistically significant and making any inferences about a strategy from one trade is dangerous, but I do find some value in what I call these “proof-of-concept” trades with real money. With most trades, achieving maximum profitability at minimum risk is the only goal. With a proof-of-concept trade, profits are important, but so is information. For this reason, I have a tendency to leave proof-of-concept trades on longer than I would when trading with an established strategy. In terms of ratios, my intent is to keep this simple. The VIX is trading at just under 49% of the VXX at the moment and my research indicates that VXX generally moves about 48% as much as the VIX on a daily basis, so with the VIX at about 22 and VXX at about 45, I elect to do this pairs trade on a 1:1 ratio basis, using 10 contracts of each to keep the math simple. In a world of maximum profitability, I would probably wait for some sort of relatively high VIX level before entering this trade, but because I am also focusing on the informational value of the trade, I choose to open the position early in the trading day on November 22nd, with the VIX at about the middle of its 10-day range. With the VIX at 22.03 and VXX at 44.98, there is a strong temptation to stay strictly at the money and short the VXX December 45 calls while going long the VIX December 22 calls. For ten contracts, the potential profit should both options expire worthless is less than $1000. Given my expectations for seasonally low volatility and also given the high level of contango in the VIX futures, I elect to shave the odds a little and short the slightly in-the-money VXX December 44 calls and go long the VIX December 22 calls. This raises the potential profit if both options expire worthless by another $200. After trying to work the order a little, I relent and take what the market gives me, recording slippage of $175 on the VIX side of the trade and $100 on the VXX side of the trade. I still manage to pocket $800 on the trade, which leaves me long VIX December 22 calls for 2.30 and short VIX December 44 calls for 3.10. The first important point to keep in mind while managing these two positions is that they run on different expiration cycles. The VIX options expire on December 17th and the VXX options expire five days later on December 22nd. For that reason, I anticipate that I will exit the position no later than December 16th, which is the last day the VXX options are traded. Monday, November 22 – As luck would have it, the VIX fell 8.3% between the time the trade was executed and the end of the day, pushing both calls out of the money and securing a $500 profit for the position. Tuesday, November 23 – The VIX reversed to the upside today and is now 0.60 higher than when the VIX calls were purchased. VXX lagged during today’s spike and is 0.06 below where it was when the VXX calls were sold. The relative weakness in the VXX sounds positive for my position, but VXX calls jumped 64% today while the VIX calls rose only 39%. The profitability of trade has turned from +$500 to -$175 in 24 hours. Monday, November 29 – After some seesaw action immediately before and after Thanksgiving, the weekend saw the Irish bailout formalized and tensions heating up on the Korean Peninsula. 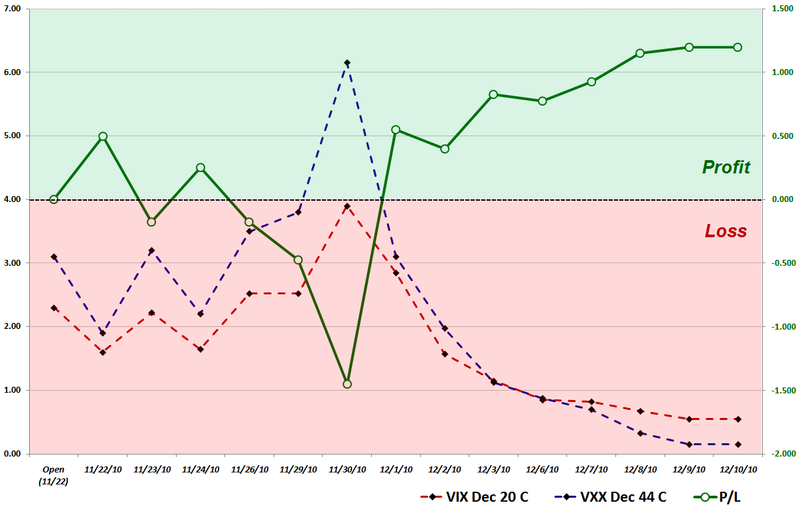 Both the VIX and the VIX December (front month) futures closed near the 21.50 level, while VXX spiked up to 46.10. The VIX calls and VXX calls are both in the money and my position is now down $475 in one week. I am now the beneficiary of $36 of theta each day, but I am disappointed that the VIX spike has had more of an impact on the VXX calls than the VIX calls. Tuesday, November 30 – The VIX closed at 23.54, its highest closing level since September, as concerns lingered about the future of the euro zone and the Koreas. My VIX long calls are now 15% in the money and my VXX short calls are 10.7% in the money, yet the VXX calls continue to be more sensitive to increases in volatility. Today the VXX calls jumped 62% while the VIX calls rose 54%. The position lost $975 today and is now down $1450 in aggregate. If this were not a proof-of-concept trade I would either be exiting the trade or making adjustments to limit risk at this stage. As it is, I will let the trade ride, as my preferred indicators suggest the VIX is ‘overbought’ and is ripe for some mean reversion. My $36 of theta is just a drop in the bucket now. Wednesday, December 1 – Today was a huge turnaround. The VIX fell 10.2% and VXX declined only 5%, yet the VXX calls lost 50% of their value while the VIX calls dropped only 27%. The result saw the position swing $2000 to a gain of $550. Friday, December 10 – The graphic below details the full lifecycle of this trade, which is coming to an end today. Of notable interest, during the last week the VIX was relatively steadfast, while VXX lost significant value due to negative roll yield and a general drop across the VIX futures term structure. The result is that VXX, which was 2.1% in the money when the calls were shorted is now 15.4% out of the money, with the calls fetching only 0.15. The VIX has fared much better, starting out 0.1% in the money and now 13.6% in the money. Due to the greater volatility of VIX options and also the extra five days in the VIX expiration cycles, the calls still hold a value of 0.55. For the last three days, the position has been registering a profit in the $1150-$1200 range. As this is almost certainly going to be whittled back to $800 in the 1 ½ weeks until expiration, I am electing to pull the plug on this trade. The first key takeaway is that with a little patience, a VIX Minotaur trade with a net short VXX position can indeed be profitable. On the flip side, this trade can be highly volatile and requires that significant attention be given to risk management. In anything other than a proof-of-concept environment, I would have exited this trade for a loss long before it had a chance to work its way back to profitability. I was a little disappointed that the VIX spike did not provide the same lift to VIX options that it did to VXX options. This was due to the fact that VXX options turned out to be much more sensitive to changes in the underlying than VIX options, which is a key learning. Future trades should attempt to establish whether this is a persistent theme. Another important consideration is the timing of the two expiration cycles. In this instance the position benefitted from the fact that VIX options expiration was after VXX options expiration. In August and September VIX options expired before VXX options, so I would have expected a more challenging environment for this trade during those two expiration cycles. Future efforts may wish to tweak the degree to which both the VIX and VXX options are out of the money and also adjust the units in the ratio to give a higher weighting to VIX options. Finally, score one point for the proof-of-concept trade. When real money is on the line, perceptions are more acute, emotional responses and their interaction with the trade are more realistic and ultimately any lessons learned are more deeply etched in the trading psyche.